This album came out back in February, but like so many great musical experiences, I didn't pick it up right away, and I didn't seek it as ardently as perhaps I should have. As a debut album from the Los Angeles-based indie band, this is about as close to perfect as possible. Gorilla Manor combines soulful touches with hints of Grizzly Bear-style vocal harmonies and perhaps hints of the earthy designs of Fleet Foxes (especially during the beginning of track 3 "Sun Hands"). What sets Local Natives apart from other bands is the big question mark, and I mean that more in a philosophical sense than a negative sense. They are a unique band that sounds divinely incredible, very nearly reaching into Beach Boys territory when it comes to vocals, but their sound feels familiar, in the way that much of indie music begins to feel familiar when a lot of it is accumulated. It makes me think of a conversation I had with friends following a film viewing of 1997's High Art (starring Ally Sheedy and Patricia Clarkson) about the dissemination of art, the way that we now have the technology at our disposal to stretch our talents to their limits and how that makes the "art world" or "music world" obsolete. Indie music is quickly becoming another industry within itself, one that lingers to take over the larger record industry. When it began, my concept at least, the idea was that so many great bands went ignored by radio and major labels and independence meant great music would be free to grow as it needed. But, are we running the risk that too much great music makes all music mundane? The more great bands exist, the less any of us can have the communal experience with music that is the root of its existence. Music was a gathering thing, something that required live performance and live attendance, but now we don't all experience the same bands because we rarely (though we do sometimes) cross paths with all these indie bands we know. Perhaps it's the burden of knowledge? Or perhaps my tastes have merely changed? I've listened to a lot of dance and soul and experimental stuff lately too. But, writing this blog, these reviews, has always been a somewhat cathartic experience, but also my chance to share these songs and bands with people. Even if many of the bands I go to review (including this one) have already seen their review on Pitchfork, or other sites that people actually read with interest, I still try to lend something to the music. The audience grows when a lot of people care about the band. With that in mind, Gorilla Manor, is one of the most beautiful albums I've ever listened to. It has strong rock sensibilities and sincere lyrics. And the range of styles from punk to folk to rock to soul are all executed excellently. Even if I hear Vampire Weekend and Ra Ra Riot and so many other bands in this music, that doesn't make it bad or unoriginal. Perhaps that's the course we're on... the issue being that art requires constant recycling, just like fashion and movies (all the reboots and remakes). No one is original, until somebody is and that is the music that blows your mind. Or maybe just blows my mind... right now, in this mode of philosophizing. 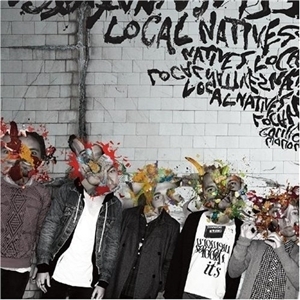 Regardless, you'll cherish Local Natives, and all the ways they're like Crosby, Stills and Nash, and early Coldplay, and all sorts of other bands. The album is really very good.